Today's post came out of a quick email conversation with Kevin, who noted that he thought that Van Cleef & Arpels Bois d'Iris smelled an awful lot like Odori Iris.1 I remembered liking the Odori well enough when I tried it, but it certainly wasn't love-at-first-sniff like the Van Cleef & Arpels. It seemed worth pulling the sample out to investigate. As so often happens, the one sample you need is the one you can't find, but I'll spare you the details of the 2-hour search: I did emerge victorious. Odori, if you remember, is an offshoot of the Italian niche line Bois 1920. The six fragrances that launched in 2008 were all supposed to be masculine, as is reflected by the heavy wood packaging. 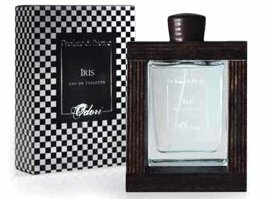 Odori's Iris starts out with the dry, rooty iris that I love, but it quickly turns sweet: heliotrope and a very faint star anise give it a lightly gourmand, sweet-iris-for-men aura, à la Dior Homme (which it is nothing like, mind you). In the early stages, it's dewy and bright. While the Van Cleef & Arpels is taking on peppery driftwood notes, the Odori strays farther into sweet with ylang ylang and a pale, ambery vanilla base. It never gets terribly sweet, and it stays more bright than not. One hour in, the Bois d'Iris is a lightly sweetened, creamy-peppery iris woods with a touch of vanilla. The Odori, without the dry woods of the Bois d'Iris to counteract the sweet notes, smells like a sweet-ish vanillic floral with iris: it's less rooty, and has a cleaner finish. We all (mostly?) agree that perfumes have no gender and everybody should wear what they like, but if I were wearing these blind, I'm pretty sure I'd peg the Odori as the feminine and the Van Cleef & Arpels as the masculine. More than that, I'm pretty sure I'd pick the Odori as the mainstream entry (it's nicely done and pretty enough, and not all that unusual) and the Van Cleef & Arpels as the niche (it's fabulous, a little offbeat and smells like a serious investment was made in the materials). Whichever one you prefer, there are no bargains to be had here: Odori Iris is $210 for 100 ml Eau de Toilette. It's a wee bit cheaper per ml than the Van Cleef & Arpels, but they're both pretty spendy. For buying information see the listing for Odori under perfume houses. As long as I was wearing the Odori and the Van Cleef & Arpels, I thought I'd pull out Prada's No. 1 Iris. This is Prada's original Iris, from the Prada Exclusives range. It launched in 2003 as part of a quartet, and I don't think Prada ever gave any serious consideration to marketing them on a wide scale, or perhaps on any scale at all — did they specifically ask for the cap to be made to look like toothpaste? The first time I went to smell the exclusive series in Prada's Soho boutique, they were sitting forlorn and abandoned on a shelf in a back room over a rack of clothing; the second time, they were in a storage closet and someone had to fetch them for me, and then none of the staff could figure out what they might cost if, perchance, I wanted to buy one. Since then, Prada has added six more scents to the set, but they've never built up a rabid fan base as have similar projects from Hermès (the Hermessences) or Chanel (Les Exclusifs). Anyway, the iris was my favorite of the initial four scents, but after the second trip, I decided I didn't need it. Later, after Prada launched Infusion d'Iris (and I decided I did need that one), I thought it might be interesting to revisit No. 1 and see if I'd missed something. No, not really. This is a very pleasant, rather middle-of-the-road iris, well-executed but not terribly exciting (the notes: iris, neroli and musk mallow, orange, vetiver, sandalwood, myrrh, incense, coumarin and musk). It's more buttery than rooty, but it doesn't have the luxurious, best-iris-money-can-buy feel of Chanel's 28 La Pausa, nor does it have the depth of the Van Cleef & Arpels. If you've smelled Infusion d'Iris, you'll recognize the similar notes, but if I was wearing this and the Infusion blind, I don't think I'd ever pick the No. 1 as the costly exclusive: the Infusion is comparatively sheer, but it has some lift; the No. 1 smells comparatively lifeless. After wearing the two together for several days, it was the Infusion that stuck in my mind; I find it hard to conjure up any memory of the No. 1 when I'm not wearing it. I don't know what Prada No. 1 Iris costs in the US — if you know, please comment. At Liberty of London, its £103 for 30 ml Parfum. I seem to remember that it came in larger sizes as well (again, please comment if you know) and you used to be able to find the whole series at Bergdorf Goodman as well as at Prada boutiques. 1. I don't think he had tried them together and it was just an offhand comment, so I'm not meaning to pick on Kevin! The carnation is especially nice, but I don’t think any of them have really made me swoon enough to match the prices so far. I do need to revisit several of them though, and there are a few I’ve never tried — I need to get some of the Benjoin. What timing—I’m wearing VCA Bois d’Iris today. Haven’t tried either of these yet, but I’ve really grown to like iris. So often it seems to be paired with citrus—sometimes lots and lots of citrus—and I like the VCA because it goes in a completely different direction. The Odori sounds worth a try! Iris is one of my favorite notes. Iris & vetiver I never get tired of. So far. The Odori is absolutely worth a try! R: Regarding iris & vetiver, how do you feel about No. 19? I recently got a dab of the extrait from Ann, and I am very seriously tempted to forego ALL perfume spending for a couple of months so that I can afford a bottle. It’s the most amazing thing I’ve smelled in quite awhile. Of course I also have a small unsniffed decant of La Pausa coming, so we’ll see how I feel about that. Just checked my notes and have never tried the extrait — that’s kind of amazing. I guess you can’t get to everything! But I do not love the EdT — too cold! — and in that concentration think of it as a green floral more than an iris scent. Adding — have you tried the EdT, and is the extrait fabulously better? The EDT does seem like a green floral to me too. I find it cool and refreshing rather than cold, so I save it for summer. I have all the No. 19 concentrations because I went through a big No. 19 phase in the 1980s. The heavier concentrations are too much for me. They actually pull down my mood and depress me somewhat. The EDT has the opposite effect. Just me, I guess. FABULOUSLY better, but I need to retest both again. To be honest, I’ve resisted testing the extrait again for fear of falling hard, but it was the most amazing iris-vetiver I have ever smelled. After that, the edt was nice, but if that’s all I tried, I probably wouldn’t have thought it to be anything special. Ok. I think that’s the last remaining Chanel I haven’t tried in extrait. I’ll work on it. R, is that either the current formulation of the edt you’re talking about or the eighties version? I suspect so. In both cases, I agree wholeheartedly with your assessment. They’ve strayed away from the iris-vetiver spotlight. The seventies edt is more leathery, less coldly green, more Joe-style. Oh, and it’s got some sandalwood, too, so it’s a little woody. Warmer, too. Robin, surely the newer stuff. But if it was redone in the last year (like everything else), then the “slightly older” stuff, because I haven’t smelled it lately. Joe, I’m such a No 19 fan I’ve tried over a half dozen formulations and strengths, and my conclusion is — and I’m sorry to say it, because I myself have harboured deep resentments towards people who always go on and on about how vintage is SO much better — that anything — especially the edt and parfum — in vintage gives you the maximum iris and vetiver hit. Other formulations have more green in them: galbanum and the like. The ultimate expression of deep, creamy iris and earthy, rooty vetiver is circa pre–mid-eighties extrait, but the edt is surprisingly good, if lighter on the iris. Hope that helps. You can always get in touch with me if you’d like a sample. Sounds like I made the right choice (for me). Splits were up for the VCA and the Odori recently, and I passed up the VCA but went in on the Odori. I’d still like to smell the VCA at some point, but when it comes to iris, I seem to prefer the more feminine treatments of it. And I’m glad to have this review now to refer to, once my split arrives. Thanks R! Looks like we’re at opposite ends of the iris spectrum Boo. I think you did make the right choice then! I’m a fan of the Odori Iris, myself. Iris is one of my favorite notes [I keep orris root on hand for my potpourri making. It’s a works as a fixative too] so anyway, I couldn’t wait to read this review. Looks like I will continue to long for the VC&A and wear my cheap thrill, Yves Rocher Iris Noir, in the interim. [Oh, and Mitsouko is very much about iris to me, but I don’t think that’s a common perception.] 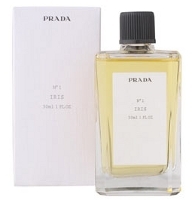 I would like to try the Prada Infusion d’Iris too. There are so many really wonderful iris fragrances. I still say nothing on earth can match SL Iris Silver Mist though! A kind fragrance pal just sent me a sample of ISM this week, but I haven’t had a chance to test it yet. I did put one tiny dab on my teen’s hand, and got the distinct impression of carrots. Might have been the influence of the Gap Grass she had on the other hand, though. I told her she was going to start attracting rabbits. No, you’re probably right — it’s VERY rooty. More like turnips than carrots to me, but some sort of root veggie for sure. Very strong in Vitamin A, that one. Agreed! Waiting on my 15ml decant from TPC January non export sale. I’m so glad you reviewed iris perfumes today Robin, I am sad my iris 39 (Le Lobo) is almost done, I adore the iris I get in le lobo leather, beautiful floral notes after the wet, damp dirt, and roots. I will need to get samples of the Odori, and the Prada iris scents, and maybe sent for a FB. Oh, it’s so sad to drain an expensive bottle like that! You haven’t tried the Id’I yet? Let me send you some…I have 2 minis, and just swapped my unloved Burberry The Beat for a bottle of Id’I (but haven’t received it yet…need to check on that one). That’s awesome Boo – yes indeed! Next time we e-mail, I want to get your address and put some samples together for you too! I’m not a huge iris fan yet, but I do like the Iris Noir, and it’s a great bargain. ISM is pretty spectacular, I have to say. Not sure if it’s “me” but it’s great. I could see wearing it to an avant-garde event. R: just did my own side-by-side comparison and Odori is more towards “femme” than “homme” to be sure, but Bois d’Iris is much more gourmand on my skin than Odori…I get lots of “cocoa” like notes mixing with woods and vanilla in Bois while Odori goes floral-powdery on me (there’s GOT to be “violet” in there). Interesting. The BdI is definitely sweet in it’s own way, but all that dry smoky wood cuts it — it just doesn’t really read as gourmand to me. But yes, floral powdery is a good way to describe the Odori. I don’t really regret shelling out for the VCA, but the Odori just doesn’t tempt me at any price. And HATE the Odori bottle. The wood bottles for He Wood/She Wood are so nice; these look so clunky. Now you guys have me doing a side by side too….Odori is more floral soft and powdery—I get a little bit of a damp soil note that I always associate with violet (?) ….VC&A Bois d’Iris is like buttery woods and iris….and I think I put it too close to the Amaranthigh I have on that arm because it seems to have re-activated some fading steamed rice …..hmmm ….I don’t have enough skin real estate left to get out the Prada Id’I ….and I’m not putting it on my knees again because y’all laughed at me when I did that. Robin –I agree–the Odori bottles are hideous; they look like a summer camp project gone wrong….maybe some dyed macaroni, and glitter glue would help…. Spray painted macaroni — yes!! Wait…someone laughed at you for using your knees? I do that all the time, esp if I suspect it’s going to be a powerhouse, a la Tuscany Per Uomo, or high on the skankometer, like Gold Man. I do it in the summer sometimes. I just don’t like using paper test strips unless I have to. Thank you for talking me out of the Odori. I’ve been circling it every so often on luckyscent but really, I can’t imagine spending that much on anything other than an Hermessence or a Guerlain. I didn’t know Odori was an offshoot of Bois 1920: if I’d known that I wouldn’t have bothered. Bois 1920 has made me fall in love with several of their top notes (I think Come de Luna has the best I’ve EVER smelled) but they never deliver (to me) with the dry down. Fruity pebbles, LOL! That’s hysterical. I did not fall for any of the Bois 1920 scents at all. I do like the Odori Zafferano, but not so much as to pay for it. I’m pretty sure iris is my favorite note as well. I have *got* to decant some of that VCA (thank you, R) into an atomizer and try it sprayed, because dabs have been merely “very nice” and I haven’t given it a proper wear. However, I feel I can safely say that The Different Company Bois d’Iris is still my favorite. I finally sampled ISM recently and I find it so close to TDC that I can’t justify the price of ISM. I really love TDC. I also very much like Iris Ganache after a recent sampling, and I know that’s not well liked. All that said, I have wanted to try the Odori for a long time. Regarding the Prada: this review makes me wonder if any of those exclusives are worth it. (Obviously “worth it” is relative.) I did get a bit of the Prada Narciso and it’s extremely beautiful, but very fleeting for something so pricey (are those edps or what?). One final iris note: I received Grossmith Shem-el-Nessim yesterday and to me it’s very much like a cousin of L’Heure Bleue, without anise and with a bit more iris. Very interesting. It probably is better sprayed! I do like the TDC very much, but the ISM even more. Did not like Iris Ganache — I think I just don’t like sweet iris. Hate Dior Homme as well, and everybody else thinks it’s brilliant. Pretty sure those Pradas are supposed to be Parfum?? But the ones I have dried are neither deep nor rich. Yeah, I thought those Pradas were parfum also… but compared to the Prada Narciso, Narcisse Noir (which isn’t really similar in composition) is positively radioactive. I liked the Guerlain Ganache. Still can’t fall for TDC Iris. I still got yours there buddy BTW. Hm, that’s the first time I heard Bois d’Iris & ISM compared! Bois d’Iris is my favouritest iris too, so ISM may not make that much of an impression on me, then. ISM has been on my to-sample-list forever, but I never got around to it. It probably doesn’t help that I can only tolerate iris in late spring and summer; in winter it’s just frozen carrot juice to me. I wouldn’t be too sure — not contradicting Joe, but to me ISM is very different. Ok, so I am contradicting Joe but all I mean is that it’s a matter of opinion. I find the TDC & the SL quite different. Thanks for the reviews, Robin! I’ve never even heard of Odori but I’ve often wondered why the Prada niche offerings didn’t get more mentions. I figured it was the (seemingly) very limited distribution but it sounds like it could be down to their marketing strategy too. Or, rather, lack of it. I still have them on my To Try When In London Next list. I’m a huge fan of vetiver but the iris is trickier simply because I’m still not entirely confident at identifying it. I do own a bottle of Hermes Hiris and love many of the allegedly iris-rich Chanel compositions but I just feel like I don’t have a clear idea of what iris smells like. The VC&A boutique in London promised to send me some samples of the Collection Extraordinaire so I’m really looking forward to trying them, Bois d’Iris and Gardenia Petale in particular. I think it’s a combination of things. Perfumistas are persistent when they want to be, and quite a few people from MakeupAlley made their way to Prada boutiques to try the exclusives early on, but still they never took hold. When the later ones came out, they seemed to make even less of a stir. As a whole, I don’t think they’re as good as some other “exclusive” series, but then again, there are some very pricey exclusive series that I don’t think are all that good and yet are all the rage, so what do I know! Oh — and if you have Hiris you must know what iris smells like even if you think you don’t! I think that it must depend on the perfumer’s interpretation. The first time time smelled 31 Rue Cambon on paper I got that carroty thing loud and clear (but it’s not as obvious on skin). And when I finally got around to trying Gentiane Blanche my first thought was “I wonder if there’s iris in this” and it is listed in the notes. But then I try something else and I’m left scratching my head trying to figure out which bit is meant to be iris. To me it’s not (yet) as obvious a note as, say, fig or vetiver or patch but that’s what makes it that much more fun at times. I tried the No. 1 Iris and the Infusion d’Iris side by side and I couldn’t tell the difference, so I bought the Infusion. Some days an unrefined nose can be an advantage! I really do think it’s a better scent — and yeah, quite the bargain comparatively! I am SO with you on that sentiment! i haven’t gone near the vcanda bois de iris…maybe later if there is more money!!! i love the dc iris and when the oppertunity and money arise…i will probably buy SL iSM blind!!! The SLs that come to the export line are spray bottles, no? I have Chergui and MKK in bell jars, and feel positively decadent dabbing them on. . .but have fears of MKK sprayed!!! Same for Tuberose Criminelle being sprayed, although I absolutely love the fragrance. Are they perhaps large splash bottles? Just wondering. Thanks! I haven’t bought one in a couple years, but they were splash bottles that came w/ an optional spray. Assume they still are, but wouldn’t swear to it. I never loved the Prada drydown, though the initial iris buzz was great. I’ve been falling in love with Different Company’s Bois D’Iris all over again, though. So mysterious, like a secret pond you find in the fog, tramping through rainy winter woods; the sound of naked branches dripping, and the wind carrying imminent spring. Wow, I’m making myself throw up. LOL! Please don’t throw up, that’s a great description. And to continue the conversation above, yes, TDC smells like the outdoors, and like natural things. I’m on an iris kick. Sampled TDC. Not a fan. Smelled like sneakers. And pine tree. Yuck. Prada is too citrusy for me. Totally cologne and fruity pebbles. ISM is incredible and life changing…but can be a little vapory and nostril-stinging in the dry down. Hiris is gorgeous. However I have a bottle that’s amazing, and then a perfumed court decant that smells like no iris and all synthetic lily of the valley. What gives? I’m convinced luca Turin smelled this impostor version when he wrote his one star review of hiris. In any case, irisss by Xerjoff is my favorite…and I can’t afford it! LOL at “sneakers & pine tree”!